For anyone who is missing teeth, dental implants New Westminster are the perfect solution. But, what exactly are dental implants? Implants are metal posts that are surgically placed into the jawbone. After a period of healing that allows these posts to be “integrated” with the jawbone, your dentist is able to mount a replacement tooth onto the post. If your dentist has already recommended that you receive dental implants, you’re probably wondering how implants work and about the different types of implants available. While your dentist can provide you with information regarding specific types of implants, here is some general information that can be useful to know before the procedure. Because the post for implants are surgically placed directly into the jawbone, they are able to provide the artificial tooth stable support. Any dentures or bridges that are mounted directly to the dental implants will not shift or slip around in your mouth. This is especially crucial when eating or speaking, as you won’t have to worry about them moving around unexpectedly. Additionally, the stability and secure fit provided by implants provides a more natural feel than conventional bridges or dentures. There are several advantages of implants over bridges and dentures. For some people, bridges and dentures are simply uncomfortable. For others, bridges and dentures aren’t possible because of sore spots in the mouth, poor ridges, or gagging. 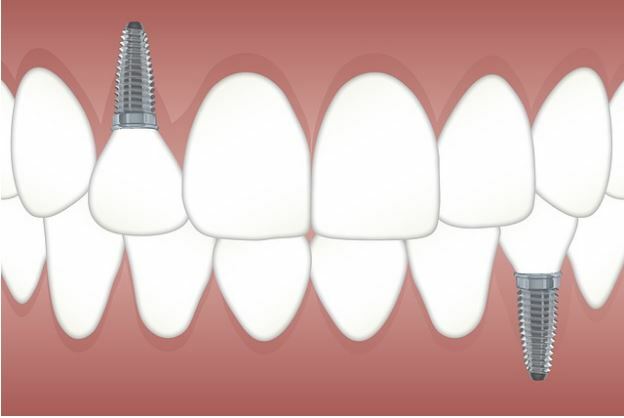 One of the biggest advantages to implants is that they do not require the adjacent teeth to be prepared or ground down, as is required for bridges. Implants are able to support and hold the replacement teeth in place on their own. Another very important advantage of implants over bridges is that they help preserve bone where the tooth is missing over the long term while bone continues to be lost when a bridge is used. What are the Requirements for Implants? In order to receive dental implants, you will need to have healthy gums and adequate jawbone to support the implant. In some cases there may not be enough bone available or there may be other structures such as nerves or sinuses that interfere with implant positioning. In these cases, bone or sinus grafting may be needed before an implant is placed. Additionally, your dentist may require that you commit to keeping your implant healthy. This is accomplished by performing meticulous oral hygiene daily and seeing your dentist for regular dental visits. These tasks are vital to the long-term success of your dental implants. At Asante Dental Centre, we use special x-rays that allow us to thoroughly assess the implant site to properly plan the surgery. We then use a customized 3-D guide to surgically place the implant precisely where it needs to be positioned. In most cases the discomfort associated with the surgical placement of an implant is minimal and is usually less than the discomfort when the tooth was extracted. Dental implants New Westminster are the perfect solution for missing teeth. Working with your dentist, you will be able to find the right solution to bring back your perfect smile without having to worry about the discomfort of dentures or bridges. In fact, implants look so natural, no one will know they aren’t your real teeth.